Our most innovative dynamic testing rheometer is designed to deliver reliable results to the most precise accuracies with an extensive range of test stages or operations. Comes complete with an Air Cooling System as standard to assist the operation of a Temperature Sweep. An ultimate choice for any polymer specialists. 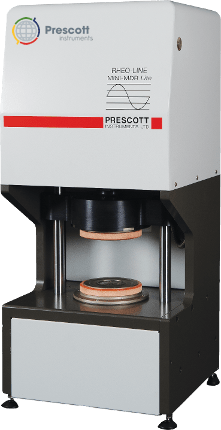 Prescott Instruments have fashioned a prefect synergy of traditional principles and the latest modern technologies to build our Oscillating Disc Rheometer, more generally known as an ODR. Our design aims to revolutionise a classic and provide a seamless transition, when upgrading laboratory equipment. The Rheoline Mini MDR Lite is a compact and lightweight take on our existing Rheoline MDR, complete with an identical sealed die configuration, delivering accurate and reliable results fast, as well as optimising space and instrument footprint. Ideal for small to medium rubber testing laboratories. Our standard MDR has been designed to carry out, tried and proven test specifications in accordance with international standards. Providing fast, accurate data and meeting the requirements of a modern testing laboratory.